Dr. Vivian Blevins is pictured with one of her students at Edison State Community College. Dr. Vivian Blevins is shown with her students at Edison State Community College. PIQUA — One Edison professor is using stories to connect people with each other and with history, particularly the history of veterans in the Miami Valley. Dr. Vivian Blevins has taught undergraduate and graduate students as well as prison inmates and now teaches communication and American literature at Edison State Community College. “I’ve never lived anywhere as long as I’ve lived in Piqua,” said Blevins, who has lived in more than 30 places throughout Ohio, Kentucky, Texas, California and other locations. Blevins has used plays and other forms of storytelling to help students at the colleges and universities she has worked at to tell their stories and connect. 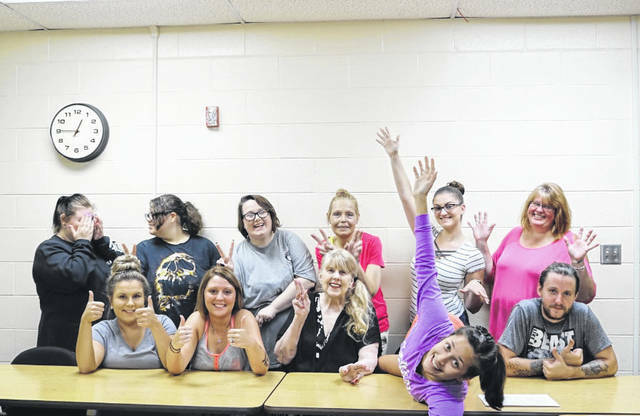 One of those plays include “Women’s Untold Stories,” which her female students and women from the community performed at the Mayflower in Troy as well as a Reader’s Theatre she hosted. For Blevins, plays and drama provide an opportunity for the audience to reflect on their positions on social injustices. Blevins also is committed to working with veterans and helping them tell their stories. Her initiative with preserving veterans’ stories was inspired when she began facilitating discussions between her students and veterans, including when she first hosted World War II veterans in one of her classes. “We paid homage to them. We had them talk about their roles in World War II,” Blevins said. Blevins and her Edison students went on to interview more than 40 veterans in the Miami Valley as part of the Veterans History Project through the Library of Congress. She has been recognized for her volunteer work in collecting veterans’ stories in 2017 at the Miami Valley Veterans Museum and the Western Ohio Korean War Veterans. The Piqua Public Library is also home to the Dr. Vivian B. Blevins Collection of Miami Valley Veterans Stories, which were made available in October 2016. Blevins continues to tell their stories as she writes for seven newspapers. She explained that there is value in collecting these first-person stories. “We should make an attempt to understand other and appreciate others,” she said. Blevins took that philosophy to heart when she was the president of Robert E. Lee College, located outside of Houston, Texas. When there was a shortage of Hispanic students enrolling in the college, she created a Hispanic Access Committee to see “what are some experiences we could bring into” the college to inspire more enrollment. Blevins was recognized as Edison’s Employee of the Semester in 2016, was the guest speaker at the Versailles Memorial Day Service in 2017 and was the grand marshal of the Piqua Memorial Day parade in 2016. Blevins attributed the recognition she has received to the people around her who have helped her accomplish her goals. She has received numerous awards from Texas Woman of the Year to the Barbara Jordan Award, but she said, “It’s always because so many others have worked with me. Seldom does a single person get much done. This entry was tagged Edison, Edison State Community College, Vivian Blevins. Bookmark the permalink.